CAMBRIDGE, ON – Grand River Brewing has announced release details for a special 5th anniversary edition of Jubilation Winter Warmer. A 7% abv ale brewed with orange peel, cinnamon and nutmeg, Jubilation has become an annual winter tradition for the brewery, and has usually been available on draught and in 500 ml bottles from the brewery. For this year’s edition, however, Grand River will be offering the beer in a limited edition 650 ml bomber bottle, with only 4000 being produced for sale. 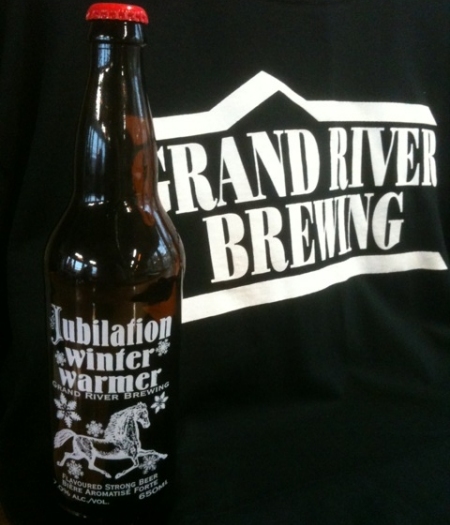 This anniversary edition of Jubilation Winter Warmer will be available exclusively at the Grand River Brewing retail store, where it will sell for $6.50 per bottle. A small number of kegs and casks will also be available at select bars and restaurants in Ontario.